No other dolphin species is known, studied and beloved in the world more than the bottlenose dolphin. Charismatic, playful and intelligent are some of the words often associated with this dolphin. And it has been presented in several manifestations of human culture such as films, literature, television, and much more, but not only in modern times, since the age of the Greek civilization, there are records of interaction with this cetacean. Its presence in aquariums and dolphinariums is also very common which makes it the most familiar and recognized species of dolphin. HOW DO THEY LOOK? PHYSICAL CHARACTERISTICS. 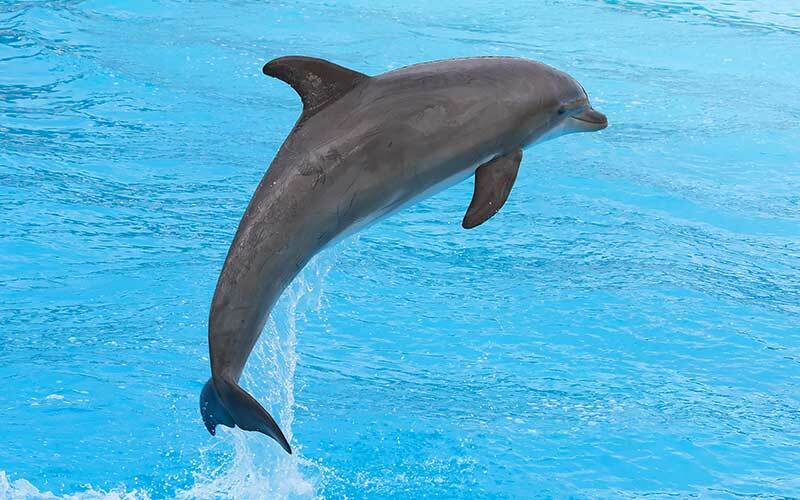 The bottlenose dolphin has a fusiform and robust body, extremely efficient for keeping a fast speed when swimming. Its snout is short but thick and well defined which gives it the colloquial name. Its dorsal fin, located in the center of the dorsal area, is big and curved. Males are somewhat larger than females. In adulthood, adults measure 2 to 4 meters and weigh between 150 and 650 kilograms. Its skin is dark gray in the dorsum, a bit lighter gray in the sides and light gray color in the ventral region which sometimes is whitish. Bottlenose dolphin – Tursiops truncatus. WHERE DO THEY LIVE? DISTRIBUTION AND HABITAT. The bottlenose dolphin dwells in tropical, subtropical and temperate waters between latitudes 45° north and 45° south. This cetacean is native to the Pacific Ocean, the Atlantic Ocean, the Indian Ocean and the Mediterranean Sea. Although they do not usually live in polar areas, it can be present in northern Europe. 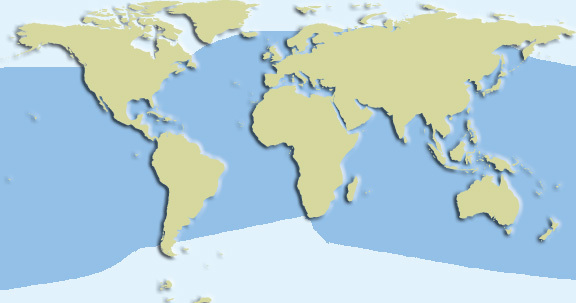 It is a very adaptable dolphin because it has a great variety of habitats either on the open ocean and near the coasts. It has the possibility of living in bays, estuaries, coastal areas and low-depth places as well as the high sea. WHAT DO THEY EAT? DIET AND EATING HABITS. The bottlenose dolphin has a vast diet based on the consumption of fish, cephalopods, and crustaceans. But, given their extensive and differentiated distribution, their feeding habits vary depending on the region they inhabit and the habitat where they dwell. Bottlenose dolphins living in high seas feed on several species of fish and pelagic squids, while dolphins near the coasts consume fish and benthic invertebrates found in coastal areas. The diet of any dolphin depends on the availability of prey in the environment. Atlantic brief squid (Lolliguncula brevis). Squid of the genus Loligo. Their prey has a small size, measuring between 5 and 30 centimeters in length. They can feed individually but often cooperate with others to hunt, especially when dealing with a large school of fish. In these cases, the dolphins coordinate to chase or herd the bank swimming very agile to keep the school together and take turns to swim through the school feeding very efficiently; Some other times, they use their echolocation to find or stun prey. Once they have found food nearby, they catch it and holds it tightly with their teeth. To kill it, dolphins shakes it in the air and sometimes hit the body against water or strike it with its tail. Then swallow it entirely, without using the teeth to chew. These dolphins also feed in unusual ways: if they have the opportunity, they follow the fishing boats to consume discarded animals or take captive fish in the fishing nets. Probably you have seen how this dolphin confidently approaches humans and jumps in the air. 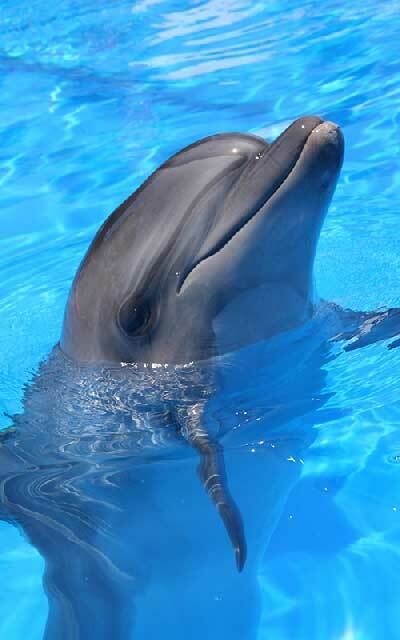 The bottlenose dolphin is very common in dolphinariums due to its excellent adaptability and relatively easy training. 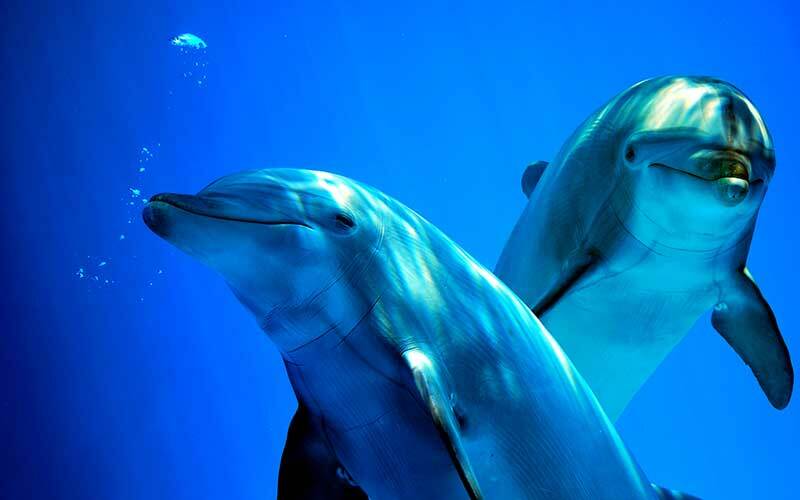 It is an intelligent animal, and most knowledge about dolphins is the result of research made on this species. Their pods are socially open, made up of 2-20 individuals, except for some occasions when they group into super pods with hundreds or even thousands of them. A society of bottlenose dolphins contains a group of mothers with their offspring, a group of young individuals and a group of adult males. Their friendly and empathetic behavior is evident when they help buddies unable to swim, and this is more manifest in mothers who have lost calves. The bottlenose dolphin partners with several species of dolphins and cetaceans and has even interbred successfully with the false killer whale (Pseudorca crassidens). Active and playful, it can perform a large variety of movements and stunts: it strikes its tail against the water, rides the bow waves created by boats and jumps out of the water full of energy. Bottlenose dolphin jumping in the aquarium show. HOW DO THEY REPRODUCE? MATING AND REPRODUCTION. The sexual maturity of this polygamous dolphin varies according to the place where it lives, but the age ranges between five to ten years for females and 8 to 13 for males. However, males usually mate for the first time at around 20 years old. Usually, males create alliances to look for receptive females in heat. Once they found possible partners, they try to attract them by arching their back, touching their body and making sounds. They mate joining their bellies in the same direction. The gestation period lasts about 12 months, after which the female gives birth to one offspring any time of the year, this can happen every 3 to 6 years. WHAT IS THEIR CONSERVATION STATUS? THREATS AND CONSERVATION. – Bycatch in gillnets, trawls and draft nets. – The intentional catch in some countries for human consumption or bait. – Contamination of its habitat. The Marine Mammal Protection Act of 1972 protects the life of this species, as well as the Habitats Directive of the European Union. In Bulgaria, Romania, Turkey, its hunting is prohibited and included in Appendix II of CITES (Convention on International Trade in Endangered Species of Wild Fauna and Flora) as a species in need of regulation on its trade. William F. Perrin, Bernd Würsig, J.G.M. ‘Hans’ Thewissen. Encyclopedia of Marine Mammals. Academic Press, 2009. Page 249. Jefferson, Webber, Pitman. Marine Mammals of the World: A Comprehensive Guide to Their Identification. Academic Press, 2015. Page 238.